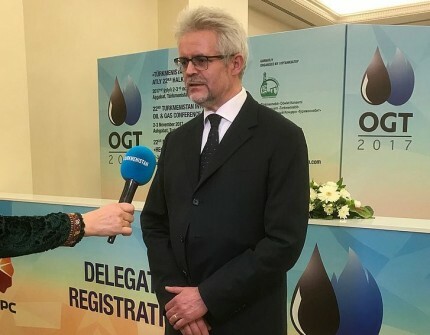 Energy Charter Secretary General Dr. Urban Rusnák was participating in the 22nd Turkmenistan International Oil & Gas Conference (OGT) which took place in Ashgabat on 2-3 November 2017. OGT is a leading regional and international event that brings together top-level leaders to discuss key issues of international energy cooperation and global energy security. Dr. Rusnak spoke at the plenary session of the Conference on the role of the International Energy Charter in shaping the energy strategies of the future. He especially focused on the major achievements of Turkmenistan as the Chair of the Energy Charter Conference in 2017. During the visit to Turkmenistan, a bilateral meeting was held between the Secretary General and Deputy Chairman of the Cabinet of Ministers of Turkmenistan, Chairman of the Energy Charter Conference M.Babayev, during which the issues of modernization of the Energy Charter Treaty and preparations for the 28th session of the Energy Charter Conference to be held November 28-29 in Ashgabat.